This is the first book in the series that really felt heavily thematic to me (not in a heavy-handed way, but in a rather subtle way). I will admit that this book is not what I remember it being — it’s good, yes, but it’s quite dark. 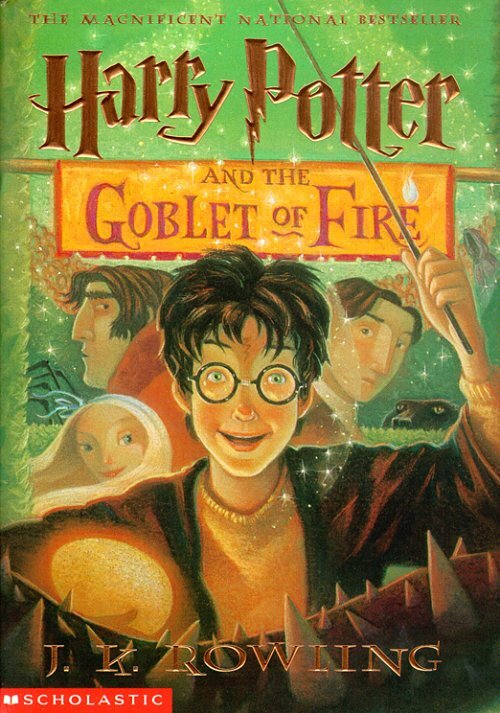 Very serious, almost right from the start, although Rowling has a knack for balancing weighty moments with humorous ones.In any case, as I read The Goblet of Fire I realized that there’s a huge amount of commentary running through the book about priorities: specifically, work vs. family. You’ve got Percy Weasley, of course, and the constant half-jokes of Ron, Fred, and George that Percy would probably turn them in if it meant advancing in his career; then there’s Alastor “Mad-Eye” Moody, whose professional life has so infringed upon his personal life that he doesn’t actually have one; there is the story of Frank and Alice Longbottom, Neville’s parents, whose careers permanently destroyed their personal lives; and of course you have Barty Crouch and his abhorrent verdict regarding his own son, against his wife’s wishes and to the complete ruin of his son. I can’t leave out Mr. and Mrs. Weasley, of course, who always choose their children over work — in fact, Mr. Weasley lets promotions pass him by on what sounds like a regular basis. Since we see the world largely through Harry’s eyes, it’s pretty easy to spot the biases here; we’re not supposed to really go for the characters who’ve sacrificed family for work. While Moody isn’t vilified for his career as an auror, Harry frequently has thoughts about how he might not want to become an auror himself because of the scarring (a physical mark of Moody’s profession on his self). Similarly, the Longbottoms — who did not choose their careers over their family, but rather whose careers infringed upon their personal life in a violent manner — are not only held up as tragic heroes, but also their story provokes a wordless rage from everyone who hears about it. “The career is not supposed to do this! It should not have this power!” the book says (this is me giving the book a voice, not me quoting the book — to be clear). And of course we love the Weasleys, so Arthur Weasley’s refusal of promotions because of his love of his work and his family is also somewhat heroic. BUT…Percy and Mr. Crouch? Villains! Curs! Unfeeling beasts of men! Alright, a little melodramatic, but seriously — we’re not led to condone their actions. Take Mr. Crouch as an example. Turn your son over to the dementors while your wife sobs helplessly at your side? Heartless! Ignore your son’s desperate pleas during his “trial”? Cruel! Unjust! As far as Percy is concerned, he slowly becomes a less and less likable character as he drifts further from his family, while Bill and Charlie (who stand up for their dad and speak kindly to their mom) are the cool brothers, the successful ones, the interesting ones. Percy and his cauldron bottom reports…BORING! Bill and his earring, Charlie and his dragons…EXCITING! Suffice it to say, Rowling definitely had something to say about the importance of one’s family and the (relative un)importance of one’s career.Thematic observations aside, I loved this book just as much as ever. I forgot how much depth there is at the end with Harry’s traumatic experiences, Fred and George’s nearly-failed but neatly-saved business venture, and Hermione’s triumph over Rita Skeeter. And I completely forgot about the final bit with Snape and Sirius. Again, loved it!